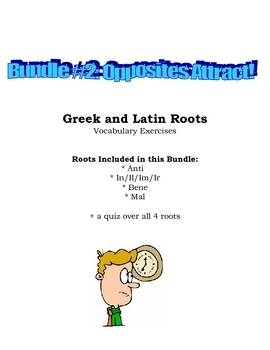 Vocabulary Exercises: Greek and Latin Roots - Opposites Attract! In this bundle, you will receive 4 different vocabulary exercises. Each is centered around a different Greek or Latin root having to do with opposites (anti, in/un/im/il, bene, and mal). In each exercise, students will read about the root. Then, they will read 8-10 different sentences that contain a word with the root in them. 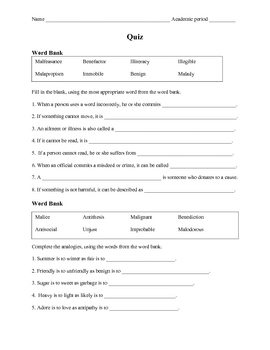 Using their knowledge of the root, context clues, and a dictionary, students will determine the meaning of the new word and write a sentence using that word properly. The bundle also includes a 13 question fill-in-the-blank and analogy quiz that reviews all of the roots in the bundle. 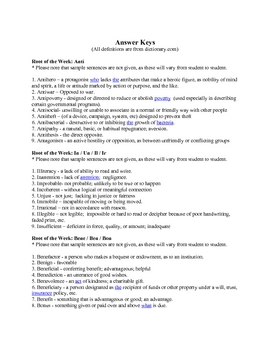 An answer key is also provided. This bundle makes great SAT/ACT prep or just simply a weekly vocabulary enriching activity.